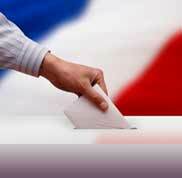 The first round of France’s presidential elections is just now days away. For the candidates, this means that the time has come to pretend harder than ever before, if not simply to cower in a glass house with a catapult. For undecided voters, it’s time to find a protractor and make some careful measurements. 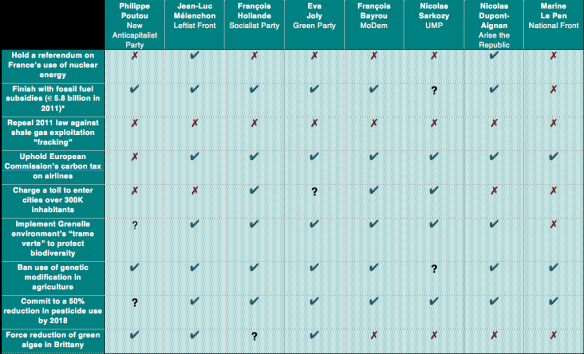 To facilitate the latter process for those who hold sustainable development dear, Le Monde has made a chart showing eight candidates’ environmental promises. I have recreated it in English below. It is heartening to see that every one of these contenders, with the notable exceptions of Marine Le Pen and an undecided Nicolas Sarkozy, wishes to finish with France’s fossil fuel subsidies once and for all. In 2011, France’s Ministry of Economy estimated that these fuel subsidies cost France 5.8 billion euros, reported Le Monde. In 2009, the International Energy Agency (IEA), the Organization for Economic Co-Operation and Development (OECD) and the World Bank prepared a joint report on the scope of fossil fuel subsidies worldwide, which they presented at the G-20 summit in Seoul, South Korea, in November 2010. The report included a roadmap for the phasing out of direct subsidies, whose estimated cost to governments worldwide was $312 billion in 2009, and was estimated to reach $500 billion by 2015 if subsidies remained untouched. 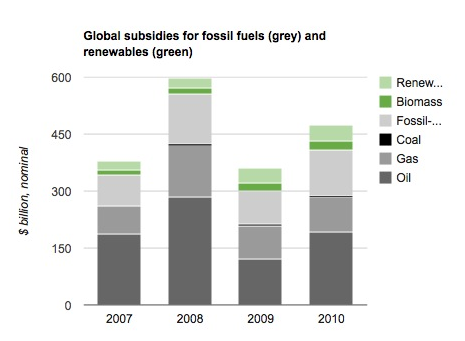 Meanwhile, subsidies on renewable energy resources are slim in comparison ($57 billion worldwide in 2009, says the OECD). This is only the beginning. 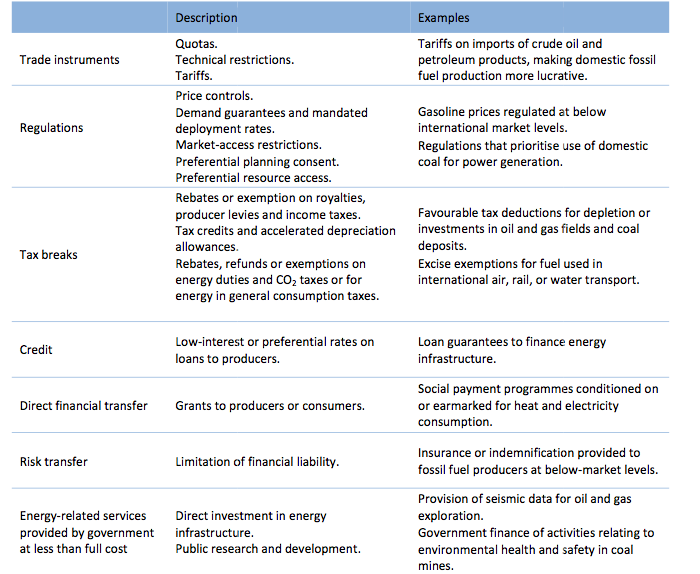 In developed countries, a range of indirect mechanisms exist that encourage the production or consumption of fossil fuels at the government’s expense, such as tax breaks and risk transfer (see chart below). The cost to the government of these indirect transfers is much trickier to measure. Beneficiaries include French taxi drivers, “who receive an annual rebate on diesel and gasoline,” according to the New York Times. If fossil fuel were no longer subsidized the world over by 2020, the expected growth of energy demand would fall by 5%, according to figures from the IEA. To put things in perspective, that represents the current consumption of Japan + Korea + New Zealand combined. Oil demand would also drop: the size of the savings is comparable to about one quarter of US demand. Where climate change is concerned, expected growth in carbon dioxide emissions would be cut by 2 gigatonnes. Best of all, the 5.8 billion euros France would save by slashing these subsidies could be used for research and development into renewable technologies, greater energy efficiency, and the implementation of green policies to protect natural resources. The clock is ticking, President Sarkozy; time to turn that wavering peut-être into a resounding mais bien sûr.